Now more than ever, enterprise leaders are looking for reliable information to help them make prudent business decisions. Enterprises pay for IT systems not because they are enamored with technology, but because they depend on the business intelligence those systems deliver. If the systems deliver unreliable or irrelevant information, the business is at risk. IT leadership and staff are under pressure to ensure that their IT systems deliver useful, reliable business information. Unfortunately, they don’t always do so. 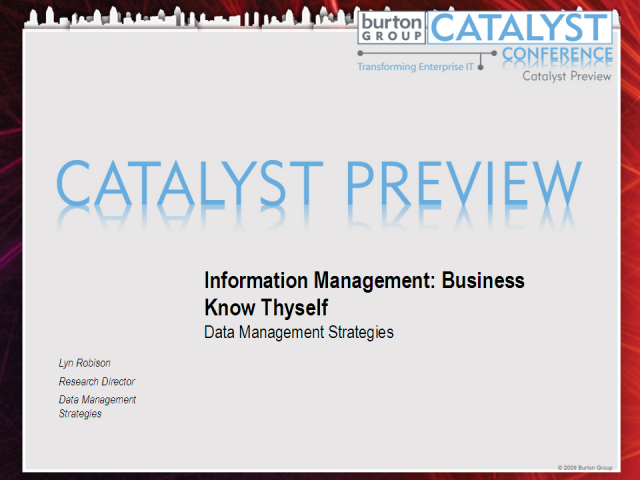 At Catalyst 2009 we’ll discuss why that is and what enterprises can do about it. We’ll talk about disciplines such as business intelligence, analytics, master data management, data warehouses, integration, governance, information management, data quality, cloud data services, and data modeling, and their associated technologies and tools. The right approach to business intelligence, combined with competencies in data management, can ensure that IT systems deliver useful, reliable information to the business.